Every DIY project needs a great soundtrack to craft to, and Christmas projects are no exception. 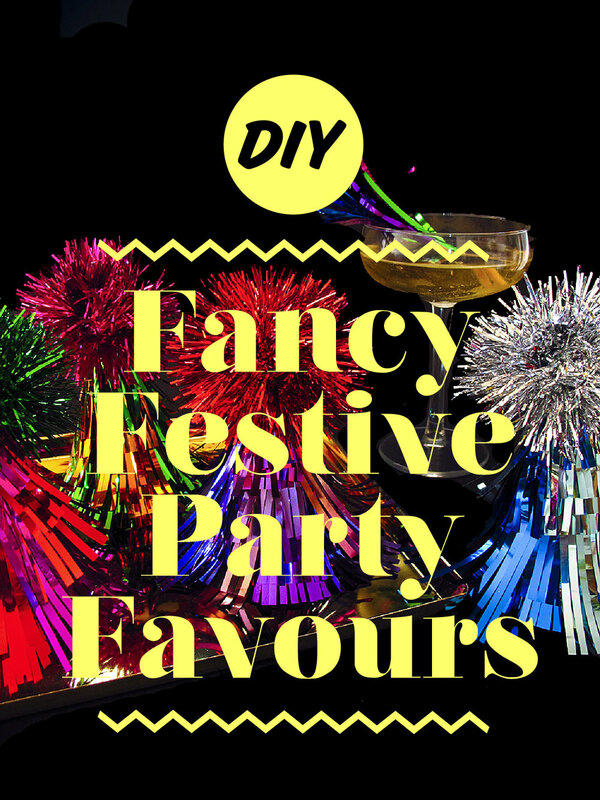 I partnered with Sony Music Australia to create a truly extra DIY for the holidays, inspired by their ultimate festive playlist Christmas Songs! Why don't you pick a song from the playlist, then read on to learn how to make these fabulous fringed favour boxes. Ditch the crackers this year because these shiny guys are filled with treats and candy. The best bit? After you've popped them open and discovered all the goodies inside, they double as party hats too! Pick a song from Sony's Christmas Songs playlist to get you in the mood for Christmas crafting. Unsurprisingly for anyone that knows about my love for 90s RnB, my favourite is Mariah Carey’s All I Want for Christmas is You! Trace around the base of each party hat onto glitter cardstock, then cut out these circles. Fill your hats with treats, then use dabs of hot glue to affix each circle onto the base of each hat, sealing the treats inside. Make little even cuts along the metallic streamers to create fringe. Create some long fringe as well as shorter bits to add texture. Use double-sided tape to affix the fringe onto the favour boxes, starting from the base and layering up to the top. Once your box is covered in fringe, add the finishing touch. Use hot glue to affix a tinsel pom pom onto the tip of each box. Once finished, use your festive favour boxes instead of crackers at Christmas dinner. Invite your guests to prise open their boxes to reveal the treats, then wear the box as shiny hat and get in the Christmas spirit! This DIY was sponsored by Sony Music Australia. All opinions expressed are my own. We hope you love it!